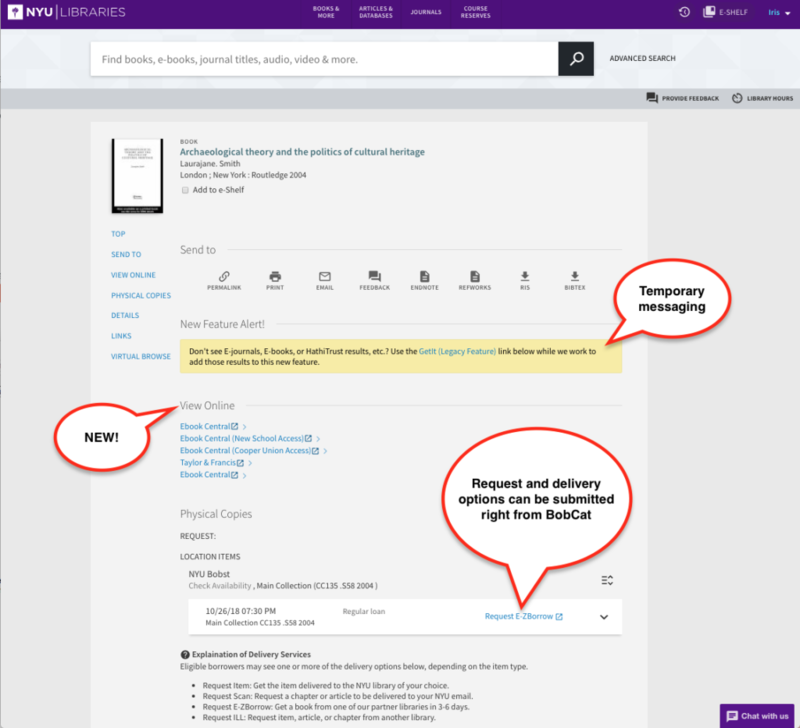 During the spring semester, NYU Libraries released a beta version of the new BobCat and sought feedback from users. Thank you, for your willingness to share your experiences and ideas about how we can make BobCat work best for you. The positive response we saw in the data confirms that moving to the new interface is the right choice to support our users’ research needs now and in the future. Bookmarks from the old interface will redirect to the new one once the system is back online. Bookmarks from BobCat Beta will be disabled. Visit the NYU Libraries Status Page for alternative resources and updates on system availability. What will be new in BobCat? Search experience improvements with a single-search bar, collection-scoping, and an update to the advanced search features. Virtual Browse is a new discovery feature. Filters & facets have new features and look. Item details screens were updated. Search history is more robust. Report issues, give feedback or suggest new features right from the interface. The catalog search tool on the Libraries’ websites and research guides will also get an update. We welcome feedback and will make ongoing improvements to the system. Use the BobCat Feedback form to share general feedback, report bugs/errors, or suggest new features. Within the BobCat interface use the “Provide feedback” link. We look forward to continuing the conversations about how NYU Libraries’ can support your discovery needs. A beta release of the new BobCat, the library catalog, is available for trial March 5th. The interface has a modern look and feel, offering new features in addition to all the features of the current interface (BobCat Classic). Both Classic and Beta will run simultaneously throughout the spring semester. What’s new in BobCat Beta? Search experience improvements with a single-search bar, collection- scoping, and an update to the advanced search features. Report issues, or just tell us you think about the new BobCat, right from the interface. Please note, a beta version is a test phase before the release of the final product. BobCat Beta is close to the final product, but there may be bugs or features that aren’t available yet. You may see changes to the interface during beta. As we get feedback, we’ll be making improvements. How do I try out BobCat Beta? 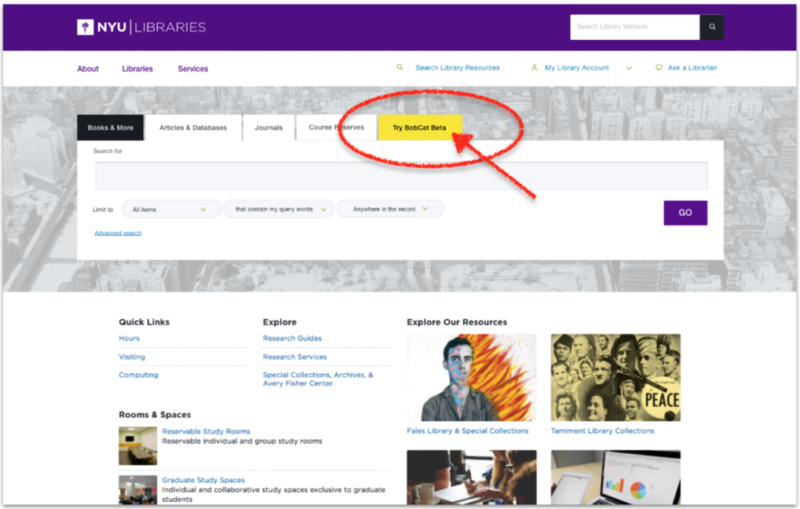 Starting March 5th you’ll see a new tab for BobCat Beta in the resource search tool on the library.nyu.edu. You can get to BobCat Beta from the yellow tab on the Libraries’ website. BobCat Beta will be available throughout the spring semester. The new interface will replace BobCat Classic before the fall semester.